Open Saturdays and Sundays from 9:30 am to 4:30 pm. Closed weekdays (except to pre-booked community and school group visits). Children's Discovery Centre has been designed to encourage parents or caregivers to play together with their young children. Admission tickets are required for every visitor, similar to the ROM, Science Centre or other major cultural attractions in Toronto. *Online ticket buyers avoid line-ups. INDIVIDUAL MEMBERSHIP* Unlimited visits, one per person (adult or child), $75 each (plus taxes). Children’s Discovery Centre is pleased to offer group discounts to a variety of community-based organizations and educational institutions, such as public and private schools; daycares, preschools, day camps, community facilities, charitable organizations, and homeschools. Group Rate: $10 per child (plus taxes); minimum of 10 children. Ossington 63 Bus from Ossington subway station (Bloor-Danforth line) Exit at Strachan & East Liberty Street. King 504 streetcar from St. Andrew subway station (University line) or King subway stations (Yonge line) or Dundas West station (Bloor-Danforth line) Exit at King & Strachan, and walk 5 mins. south along Strachan to East Liberty/Ordnance. Harbourfront 509 streetcar from Union station (Yonge-University line) Exit at Strachan, and walk 5 mins. north along Strachan to East Liberty/Ordnance. Bathurst 511 streetcar from Bathurst subway station (Bloor-Danforth line) southbound towards Exhibition; exit at Strachan, and walk 5 mins. north along Strachan to East Liberty/Ordnance. From the West: Follow QEW/Gardiner Expressway eastbound and take Jameson exit. Follow Lake Shore Blvd. West to Strachan Avenue. Turn left onto Strachan Avenue and continue north to Ordnance/East Liberty Street. From the East: Follow Gardiner Expressway westbound and take Lake Shore/Spadina exit. Follow Lake Shore Blvd. West, past Bathurst Street to Strachan Avenue. Turn right onto Strachan Avenue and continue north to Ordnance/East Liberty Street. From the North-East: Follow Highway 404/DVP southbound to Gardiner Expressway. Follow Gardiner Expressway westbound and take Lake Shore/Spadina exit. Follow Lake Shore Blvd. West, past Bathurst Street to Strachan Avenue. Turn right onto Strachan Avenue and continue north to Ordnance/East Liberty Street. From the North-West: Follow Highway 427 southbound to Gardiner Expressway eastbound to Toronto. Follow QEW/Gardiner Expressway eastbound and take Jameson exit. Follow Lake Shore Blvd. West to Strachan Avenue. Turn left onto Strachan Avenue and continue north to Ordnance/East Liberty Street. There is some street parking available on East Liberty, Ordnance and neighbouring streets. 901 King West office building (parking entrance off Caniff Street). 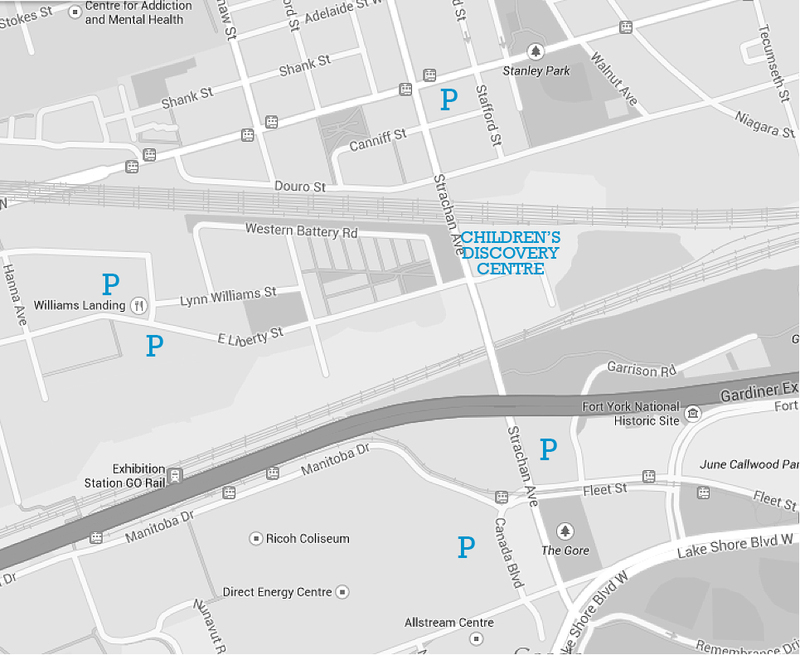 Children's Discovery Centre has a small parking lot available for visitors, located on the east side of the building. Children's Discovery Centre is committed to making its exhibits, programs, and amenities accessible to all children. On-site parking is available for our visitors with limited mobility.